NIU’s 2015 Outstanding International Educator. 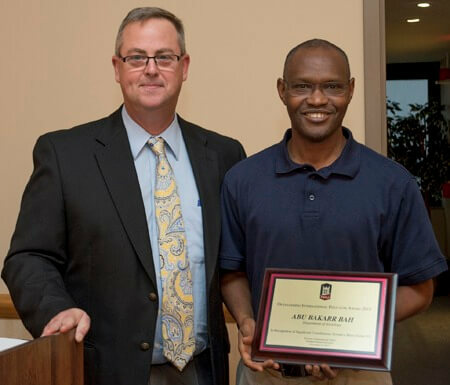 Abu Bah, an associate professor in the Department of Sociology, has been selected as the recipient of NIU’s 2015 Outstanding International Educator Award. The announcement was made during the annual International Recognition Reception, one of many events on campus marking International Education Week. International Education Week is sponsored by the Division of International Affairs. International Affairs also tapped NIU’s Department of English as the 2015 Outstanding International Department. Jiaqi Li was selected for this year’s Outstanding Contribution to International Education by an International Student. Li is a graduate student from China, who is pursuing his master’s degree in the School of Music. Shanay Murdock was selected for this year’s Outstanding Contribution to International Education by a domestic student. Murdock is an undergraduate student studying anthropology.